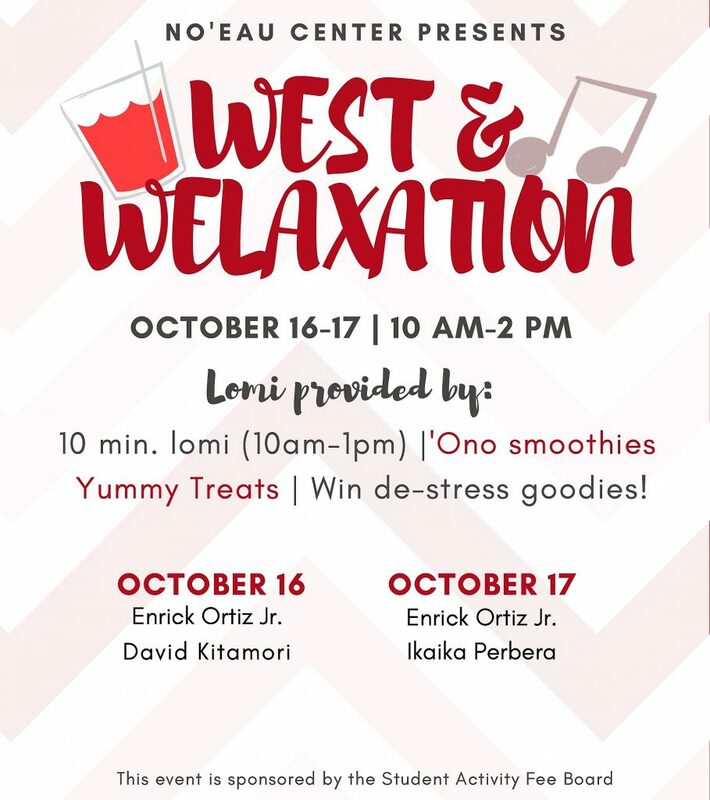 No’eau Center is hosting its semesterly event West and Welaxation on Wednesday, Oct. 17 and Thursday, Oct. 18, in collaboration with E Ola Pono week. The West and Welaxation event is designed to help students unwind during midterms and to re-energize for the last leg of the semester. During these two days, students who sign up in advance at the No’eau Center can enjoy a free ten-minute massage (10 am-1 pm) from masseurs Enrick Ortiz Jr., David Kitamori, and Ikaika Perbera. They can also enjoy refreshments, including cold and sweet smoothies from Da Spot and healthy snacks. Students can also have a chance at winning some de-stress items after filling out a survey. This event is from 10 a.m.-2 p.m.on both days and is is sponsored by the Student Activity Fee Board. Tagged Noeau Center, University of Hawaiʻi-West Oʻahu, West & Welaxation, www. Bookmark the permalink.